"My disability is not stronger than my ability"
Sunny’s life story exemplifies that dreams can be achieved by determination. The 21-year-old boy from Baghpat, Uttar Pradesh had witnessed misery and hardship throughout his life. His father, a farmer by profession was affectionate and caring but couldn’t financially support his family of four children. Living in the world of bare necessities, Sunny always desired to help his family monetarily but due to physical disability in both his hands, he always fell short of realizing his dreams. Sunny completed his primary education in 2014. He couldn’t embark a journey of higher studies due to family’s financial constraints and couldn’t secure a job due to his physical constraints. But Sunny knew from heart that there were opportunities for him out there and giving up hope meant giving upon life. In search of a dignified and secure life, Sunny joined a Pradhan Mantri Kaushal Kendra in Baghpat, supported by National Skill Development Corporation and Empower Pragati, a training partner of NSDC. He enrolled himself for the ‘Warehouse Packer’ job course. The free-of-cost training under Pradhan Mantri Kaushal Vikas Yojana (PMKVY) not only helped him to acquire technical and operational knowledge of the industry but his confidence also witnessed an exemplary boost. The training and learning would stay with him for the rest of his life and he is keen to spread the teachings to his fellow mates. Sunny has become a changed person now with a positive perception towards life and an optimism to face the forthcoming challenges. He shares,"My disability is not stronger than my ability. Hard things have come my way, but they won’t stop me. It has given me courage and strength to move ahead." 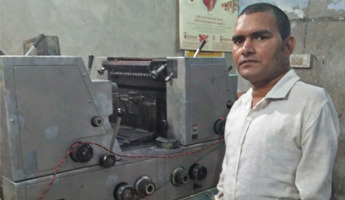 Post successfully completing his training, Sunny is now working as a ‘Machine Helper’ in Jai Chandra Printing Press in Baghpat and earning Rs. 8,000 per month. He is not only supporting his family now but is looked up to as a role model in his community. Sunny is among the thousands of persons with disability (PwD) who have acquired skill training and secured a sustainable livelihood for themselves and their families.